The evil sorcerer Balkoth and his horde of followers have laid waste to the pastoral lands of Urak. Once magnificent cities lie in ruin, and the Great Temples of the land once devoted to learning are now overrun by Balkoth’s worshippers. Those that remain pray for a leader to rise from the ashes. Lords of Magic builds on the strategy template of the Lords of the Realm series and infuses it into a fantasy role-playing epic. 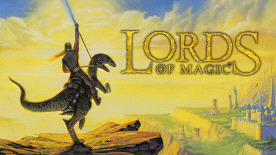 Wield fantastic sorcery as you explore the lands, develop your abilities and form powerful alliances. Lead an army into the darkness and prove yourself a true Lord of magic! Blends classic fantasy role-playing with real-time strategy combat. Build your empire and vie to control 8 distinct capitals, be it through conquest or allegiance. Choose from 24 editable Lords, and develop them into warriors, mages and thieves. Pit your armies in real-time combat against skeletons, dragons and other powerful monsters. Take on epic adventures based on the legends of Merlin, Beowulf and Siegfried.